247 Host Reliability Around the Clock - Is it Really good ? Based out of Montreal, Canada, 247-Host is a privately owned corporation built with the aim of helping people and companies host websites, blogs and media streaming by establishing a virtual or dedicated environment that features WordPress, Joomla, shopping carts, e-commerce scripts, merchant accounts MS Frontpage, MySQL, PHP, etc. Today we are going to write an article on 247 Host Reliability which will help you know about it. It was established in 2004 and promises 99.99% uptime and a 24X7X365 service support or money back. 247 Host is a good hosting company that offers a range of services to customers worldwide and has gained a good reputation in the hosting services market. 247 Host can be said to provide a very stable hosting backed by quality hardware and well-equipped data centers. They guarantee 99.99% uptime, which is better than most service providers in the market. Their customer service is good and any issue is resolved within a limited time period. Load times and other practical issues commonly seen with hosting companies seem to be under control with 247 Host. To get the best of the service provided by the company, choosing the right package according to your requirements is imperative. The pricing of most of their services has been found to be affordable and rated as fairly average going by market standards. However, it cannot be said that their rates are really great. This service has launched 5 Linux-based web hosting packages: Basic, Silver, Gold, Expert, and Platinum. These have monthly, quarterly, semi-annual, annual, and biennial billing cycles (except the Basic plan that is billed only biennially). These five plans are priced in the range of $2.99/month to $79.99/month and $139.00 to $299.00 for dedicated server services. Like most other hosting companies, 247 Host too runs special offers from time to time that give you value-for-money discounts. Irrespective of the Linux package you choose, 247 Host allows you the ease of using PayPal as well as your credit card to pay for their plan. 247 Host offers a varied list of features to choose from that suits your needs the best. It uses cPanel to manage the hosting accounts and has one-click installations in place for many site scripts that lets even the technically naïve customers work with their services. They also offer free templates that can help you create the best of websites. In case you are not satisfied with any of their services, they have an excellent 45 days money-back scheme. However, this scheme is not valid for the monthly billing packages. They offer unlimited disk space and bandwidth with most of their packages, and a 100-GB space to start with. The host data centers in the US, Canada, and Europe give them a good global positioning. Features like dedicated IPs can be fetched at an extra cost with the package of your choice. The company delivers over 250 Gbps of transfer rates and peering with the use of multiple high-capacity Tier 1 bandwidth providers such as AT & T, Savvis, Global Crossing, Level 3 and Time Warner Telecom. 247 Host also provides enhanced security features for your websites with the use of CiscoGuard XT applications and Arbor Peakflow that protect against DDoS infestations. The company has also employed experts to update and secure customer database on a regular basis. 247 Host also ensures that there is the continuous power supply and back up to local data centers. Any issues relating to the technical aspects of the data centers and servers are attended to instantly at a primary level itself so that escalation can be avoided. Each Linux shared plan features CloudLinux operating system, which offers enhanced stability and security to the servers. 247Host throws in extras on their plans like instant backups that secure against data loss and allow for instant restoration, and integration of service packs with CloudFlare CDN service that ensures a quick load time. 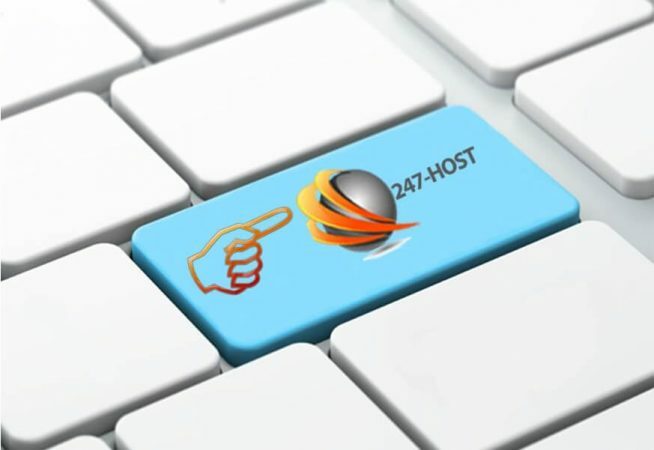 247 Host offers easy-to-access technical support that is up 24X7. They offer customer support via e-mail, phone, and even live chat for a fast and instant access to support. The company has a good track record of resolving complaints and logs in quick response time. 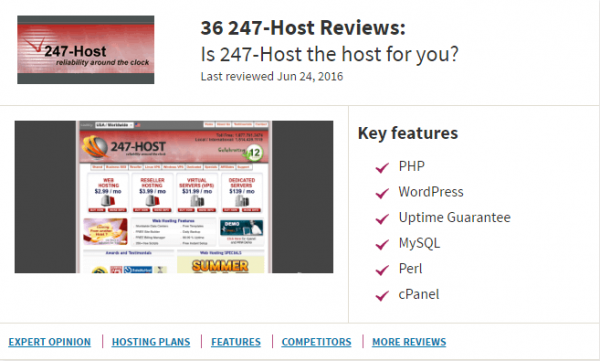 Even though most people using their service have presented good reviews about 247 Host, there have been certain negative feedbacks about the technical support offered to customers. Some customers have reported that their calls are not answered or returned. Another drawback of the 247 Host website is that they have not included any self-help section that allows you to troubleshoot by yourself. The high dependence on phone and e-mail as customer support media makes the company’s support service quite non-responsive. The company has designed their web hosting packages to not only be developer friendly. It also support PHP5 with Zend Optimizer, Python, Perl, and Ruby on Rails in order to keep compatibility issues at bay. 247 Host has spent a lot of time in the market and knows the expectations of its customers. With some of the best features and packages in the market, the company seems to be doing a good job in keeping everything running smoothly. Even though there are a lot of negative reviews from customers on the web about 247 Host, it is definitely worth getting a personal experience on their services before discarding or disregarding their services. They have a vast hardware and data network and a good global presence. 247 Host is definitely one of the quality players in Web hosting services market.